Mickey’s Gary Remley chats with NBWA attendees. 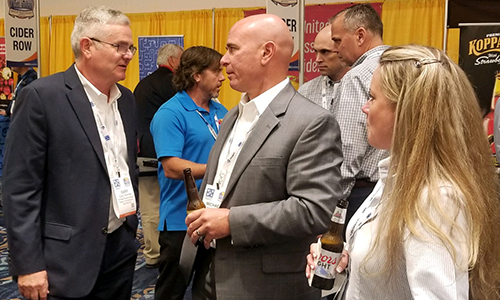 Beer wholesalers at the NBWA Annual Convention this Fall in San Diego took time out from a jam-packed agenda of top shelf speakers and education seminars to visit with Mickey Truck Bodies, their long-time body and trailer supplier. Beer wholesalers have come to expect delivery solutions from Mickey Truck Bodies, including innovative features like our keyless door locking system. “Many of our customers attending the show came to our booth not only to talk about potential solutions, but also to thank us for what we have accomplished together,” says Gary.